The easiest way to satisfy your donut cravings, with no finicky yeast or rolling required. Just mix, fry, and eat! Can we all just agree that donut cravings are real, and they’re not just for pregnant women? Because y’all… I was hit with some MAJOR donut cravings last week. It doesn’t help that there this amazing donut shop that I literally drive right past at least once a week… BUT, I’m trying not to gain a million pounds and spend money there every week. But those cravings man, I couldn’t help myself! So instead of stopping in the shop, yet again, I came up with a recipe for quite possibly my favorite type of donut of all time. Donut holes! So cute and pop-able, they’re the donut you can eat in one bite! Traditionally yes. When donuts were rolled out and cut into that classic donut shape, the dough where the center hole was removed and no doubt used in an effort to reduce food waste (and money!). 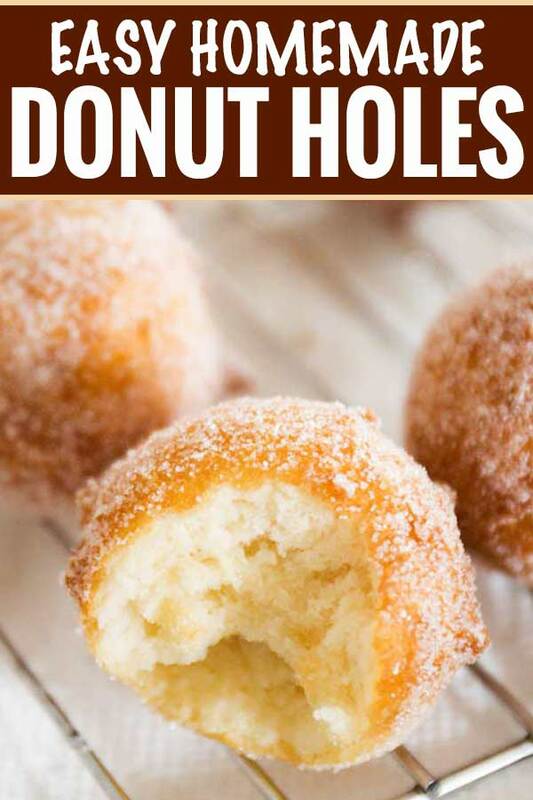 But you can absolutely make JUST the donut holes. Sadly, less than you’d think. 1 regular sized donut is equivalent to about 4 donut holes. So if you’re watching what you’re eating, keep that conversion in mind. Or be like me and just keep poppin’ the donut holes and treat yo’ self! Not necessarily! For that classic donut taste and texture, with the crispy outside and fluffy inside, you do have to fry them. But I’ve taken the dough for these chai vanilla donuts and baked little bits in mini muffin tins and gotten delicious baked donut holes that way. So it’s really up to you and what texture you’d like. 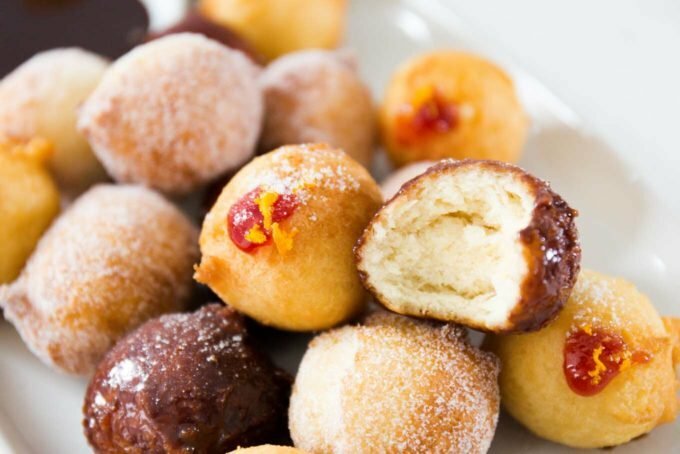 These donut holes would be classified under the “cake” variety. When it comes to donuts, and donut holes, there are two main types; cake donuts and yeast (or raised) donuts. 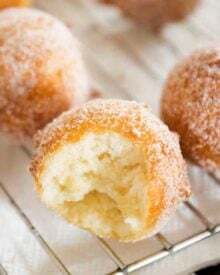 Cake donuts are made using a sweetened dough that uses baking powder to rise. Yeast or raised donuts are made using a dough that uses yeast (I know you’re shocked right? ), and involves a rising time. A classic glazed donut from Krispy Kreme or Dunkin Donuts would be a good example of a yeast donut. Personally I LOVE the flavor of a great yeast donut, but they take time to make, and working with yeast can be finicky. For a fool-proof donut, go with the cake variety. For these donut holes I couldn’t decide on a flavor, so I went with 3 types. The classic sugared, chocolate ganache dipped, and filled with an orange scented raspberry sauce. Can I just say, I literally couldn’t pick a favorite… they are all SO good! I’ve included the ganache and raspberry sauce in the recipe below, but don’t let the fancy words like “ganache” scare you. It’s quite simply the easiest sauce to make! Cookie scoop – the PERFECT tool to drop the dough into the oil with… plus it’s great for cookies and meatballs! Piping tip – I love using this tip in either a piping bag or regular ziplock for filling the donuts with raspberry sauce. Cooling rack – This is great for placing the donut holes to cool after you’ve fried them. It lifts them off the counter so they don’t get soggy on the bottom. Wire Spider – the BEST tool for removing fried foods from the hot oil! Line a large baking sheet with a few layers of paper towels then top with a wire cooling rack. Set aside. Pour oil into heavy bottomed pan (dutch ovens or deep cast iron pans are fabulous for frying), until oil is about 2 inches deep. Heat over MED heat until oil comes up to 350 F degrees. Adjust heat level as needed to maintain the 350 degree temperature. 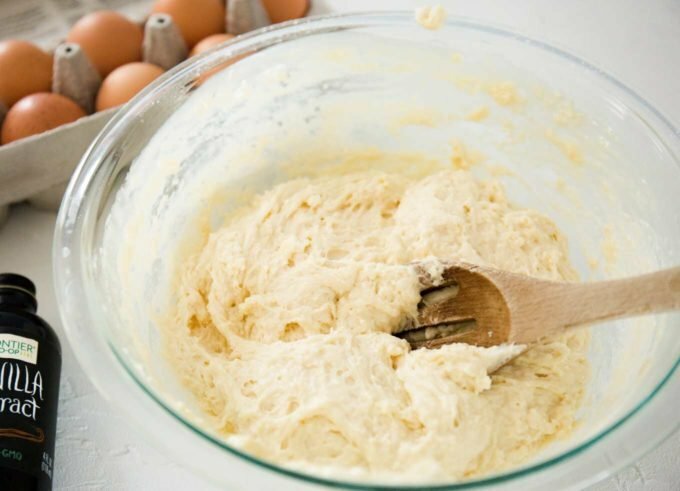 While oil is heating, whisk together flour, sugar, baking powder, salt and nutmeg in a large mixing bowl. In a separate mixing bowl, whisk together the milk, egg and vanilla. Pour the wet ingredients into the mixing bowl with the dry ingredients and stir together for a few seconds with a wooden spoon. 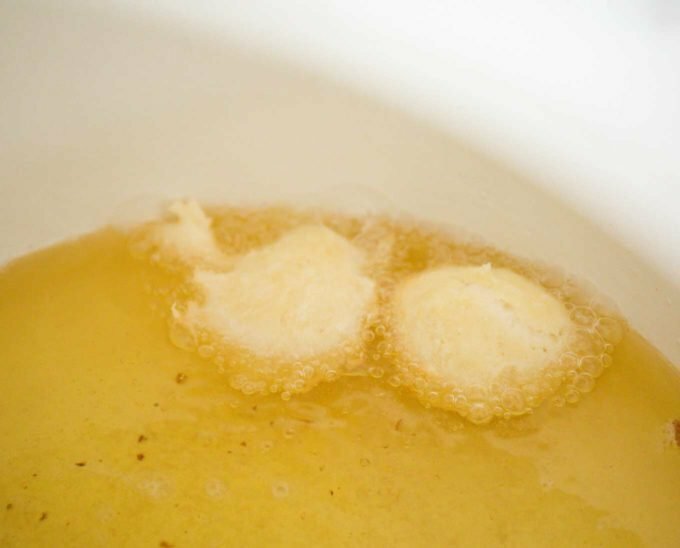 Add melted butter and stir until mixture forms a thick batter. Once oil has reached 350 F degrees, use a cookie scoop to scoop up batter and drop them into the hot oil. Be careful when dropping the batter, do it from just above the oil so you minimize splashing! Hot oil is no joke and it hurts like crazy if you get burnt! Add about 8 donut holes to the oil in one batch, and fry about 2 minutes per side. Remove fried donuts to prepared cooling rack/baking sheet. Add about a cup of granulated sugar to a shallow bowl. When you take the fried donut holes out of the oil, add them to the sugar bowl and toss to coat them in sugar. Transfer to cooling rack to cool down. 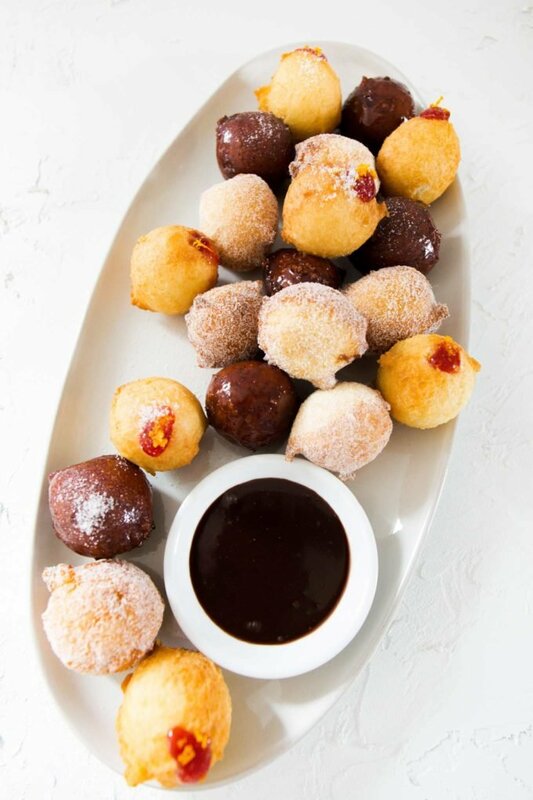 Let donut holes cool on wire rack for a minute or so, then dip into ganache sauce. Return to cooling rack to finish cooling. Alternatively, dip a fork in the ganache sauce and wave it back and forth over donut holes to drizzle them with the sauce. Let donut holes cool completely. Prepare a piping bag fitted with a round piping tip (alternatively, snip off just the tip of a corner of a ziploc bag and add piping tip to bag so it comes partially through the hole). Use the empty bag with the tip to poke a hole in the donut hole, being careful not to poke all the way through the other side. Fill bag with cooled or slightly warm raspberry sauce, and pipe into hole. Garnish with a little orange zest if you'd like. Add chocolate pieces to a mixing bowl. Heat heavy cream until simmering and hot. Pour cream over chocolate in bowl and let sit 5 minutes. Whisk until all chocolate is melted and sauce is smooth and glossy. Heat jam in a saucepan over MED heat, stirring often, until jam is loosened to a sauce consistency. Remove from heat, stir in vanilla and orange zest. Let sit 10 minutes and serve. 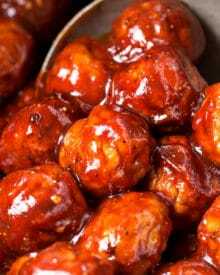 I made theses and my family loved them ! Wondering how long they last or how to store them so I can make a huge batch !! ??? Hopefully you can help with storage and shelf life ? I never make more than what we can eat in one sitting, but I think they should be okay kept at room temperature in an airtight bag or box for 1-2 days. I was going to make these for a bridal shower and put them on a skewer. Do you think I could freeze them? So that way I could make them the week ahead of time. I haven’t tested freezing them, but I think they would freeze alright. I like baking donut holes in donut hole baking pans. I’ve filled the pan cavities 2/3 full, 3/4 full and full but each time the bottom comes out half round but the tops do hot come out even close to being round. What should I do differently? I’ve never had a baked donut hole turn out exactly round, so I can’t say for certain. If you want the perfectly round shape, I’d advise frying them as directed. I am currently getting ideas for kid cooking classes that I will be conducting! I think the kids would love these! I will have kids with dietary restrictions (dairy, eggs, gluten, etc). For a vegan version, would you recommend almond milk and a flax-egg? I cant wait to try these with kids. I have zero experience in vegan baking, so I truly can’t say for certain that it would work, unfortunately. Hope the kids love them! HI! 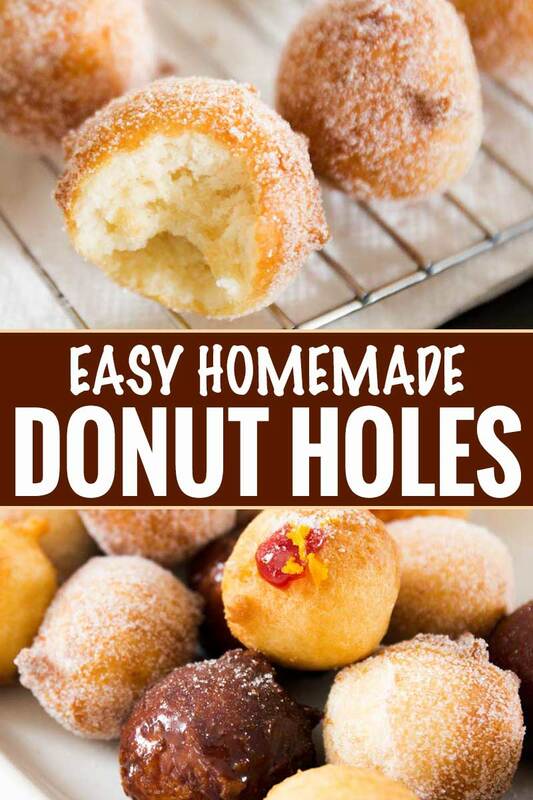 I would justlike to ask if you could bake these dougnut holes? You can! I haven’t tested it specifically, but I’ve baked other donut holes before with great success. I would bake at 375 F degrees, and fill a mini muffin pan, each hole about 2/3 full of batter, and bake 10-12 minutes. I think these are the lightest, crispiest, tenderest doughnuts I have ever made. 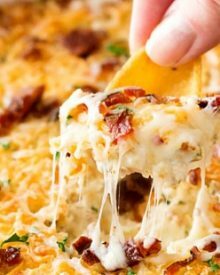 I made this recipe for the first time and it was delicious and very easy. Can I make this the night or two nights before cooking and place in the fridge? I wouldn’t recommend it, since the baking powder will start activating as soon as the ingredients are mixed. What size cookie scoop do you use? Is it the standard #40 size? Yes, I linked to the scoop I use (https://amzn.to/2G17QH0). Just made these for Christmas morning and I don’t cook very often. Super easy. I’m not sure if I did it right but most the donut holes flip themselves in the oil. The family loved it (go dad)! I made these today and they are delicious! Crispy on the outside and soft on the inside. I made a glaze and toasted some coconut and the donut holes took a roll in both. Man, are they good! Now I have a replacement for Dunkin Donuts Toasted Coconut donut that they no longer make (Who does that?). Great idea! These look so delicious! Can’t wait to try this! Kids are going to love helping make these and eating them! I’m loving the looks of these! These look so fun and tasty! Kids are going to love helping make these and eating them! Great idea! These look so delicious! This looks like a fun snack! Can’t wait to try this! I could seriously eat a whole plate of these donut holes! So good! Well now *I* have a major donut craving! 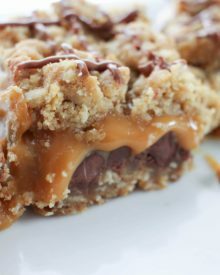 These look so fluffy and delicious (and easy to get my hands on by making some for myself)!